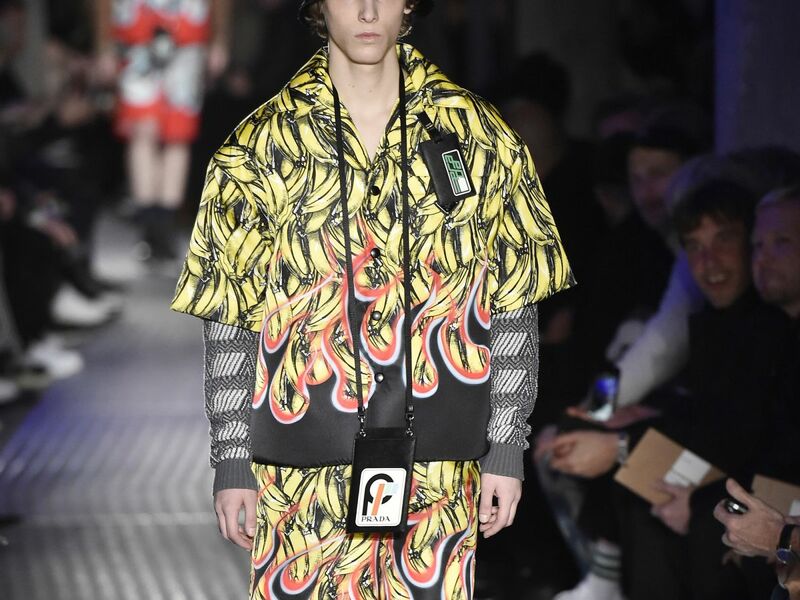 Earlier this week, Miuccia Prada presented her fall 2018 menswear collection in Milan. 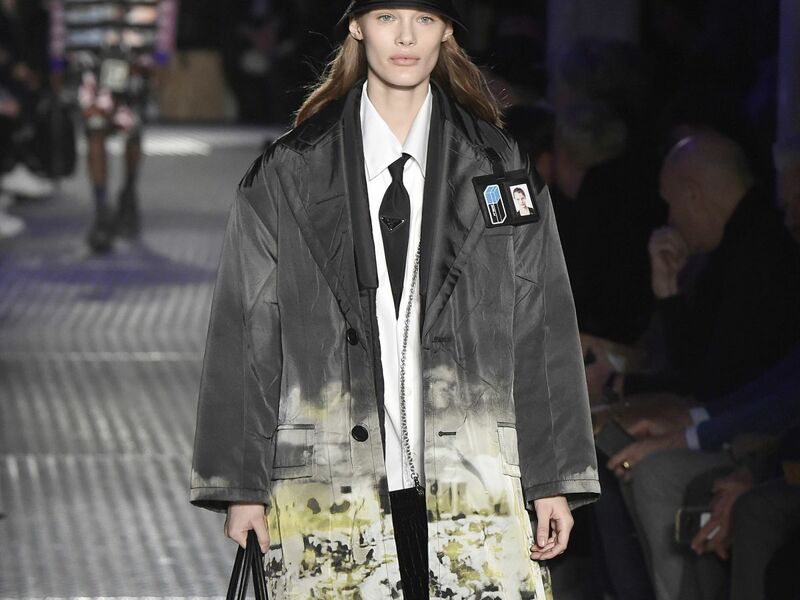 As it’s become her custom, the men’s fashion week season is also the time she shows women’s pre-collections, allowing a kind of continuity throughout menswear and womenswear, as well as a particular fluidity from season to season. 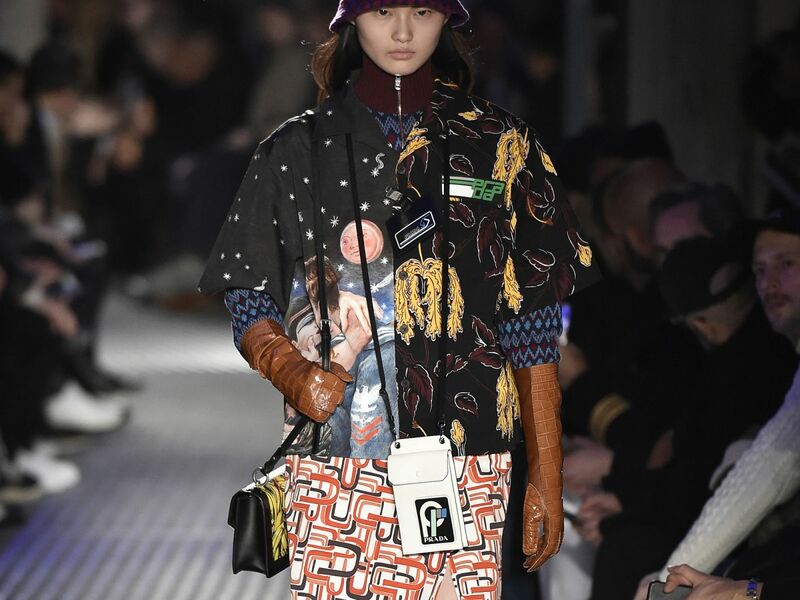 For fall ’18, Prada was looking to her past — particularly to the iconic black nylon backpack that revitalized her family’s brand and launched her career into the fashion stratosphere. But beyond the all-black padded looks that seemed like another form of protective clothing to deal with the current state of the world emerged something more playful and exciting. And it was bananas. 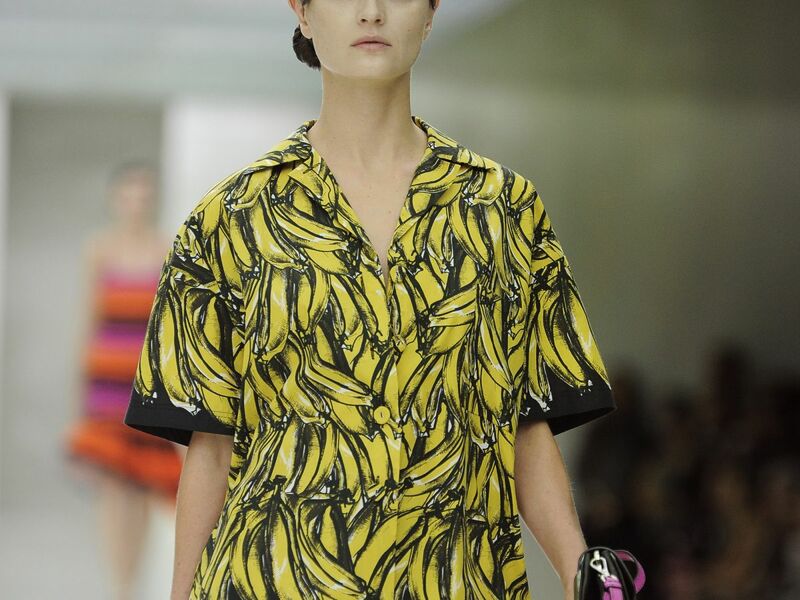 No, literally, the banana print that so captivated shoppers from her spring 2011 collection was back — and this time, it was overlaid with a graffiti-style flame. 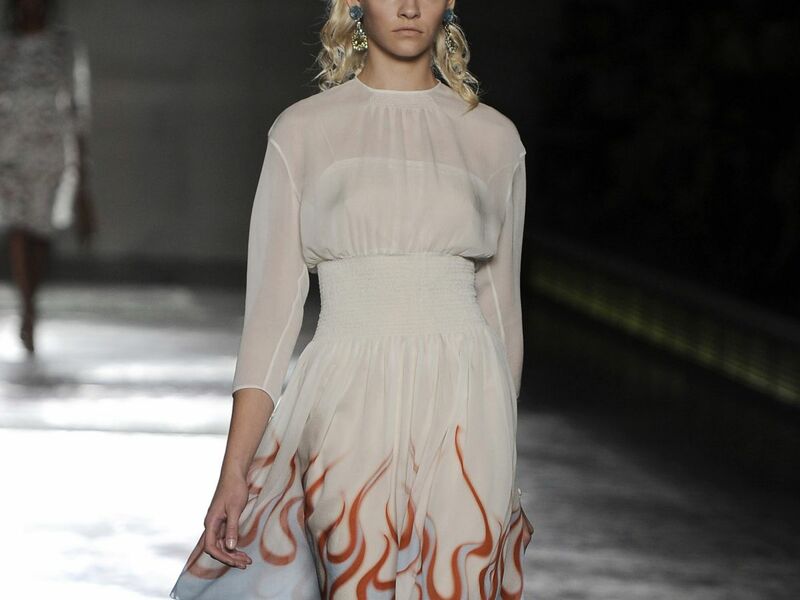 But it wasn’t just any random graffiti-style flame; it was one taken from her spring 2012 collection — a.k.a. the one with the cars. 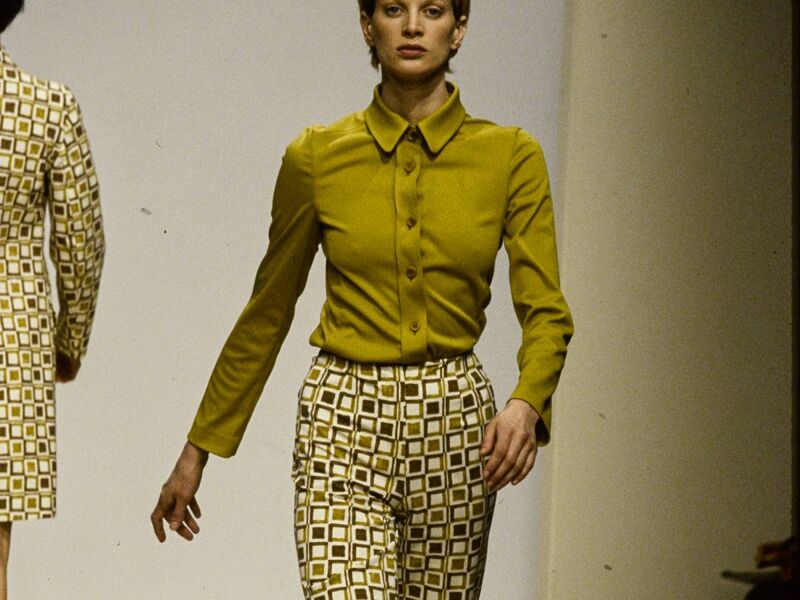 Those weren’t the only collections referenced, either: We saw a rose print from fall 2005, the lipstick print from spring 2000, and the lovers from fall 2016, all exquisitely pieced together in the same manner that a quilt is sewn together and passed through generations, telling a story. 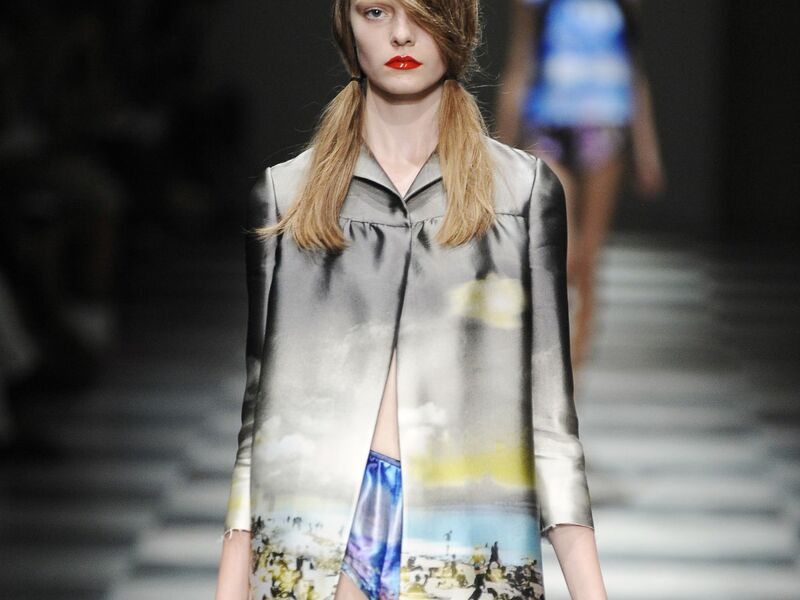 This collection was telling Prada’s story. 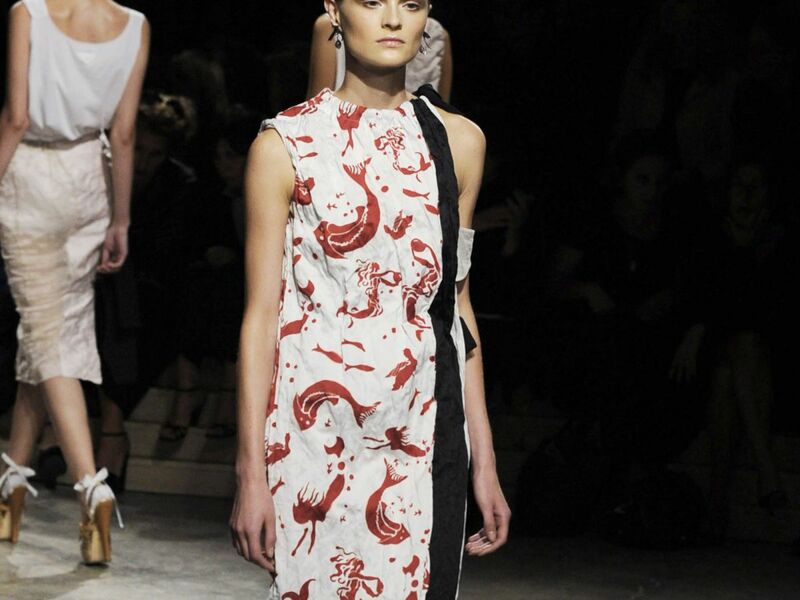 Granted, Prada has always been one of those designers who enjoys referencing her past collections (Marc Jacobs is certainly another), but this wasn’t a walk down memory lane for sentimentality’s sake; just like every other Prada collection, by looking to the past, Prada managed to capture the zeitgeist. “We are living in a period which is interesting because we do not know where we are going. 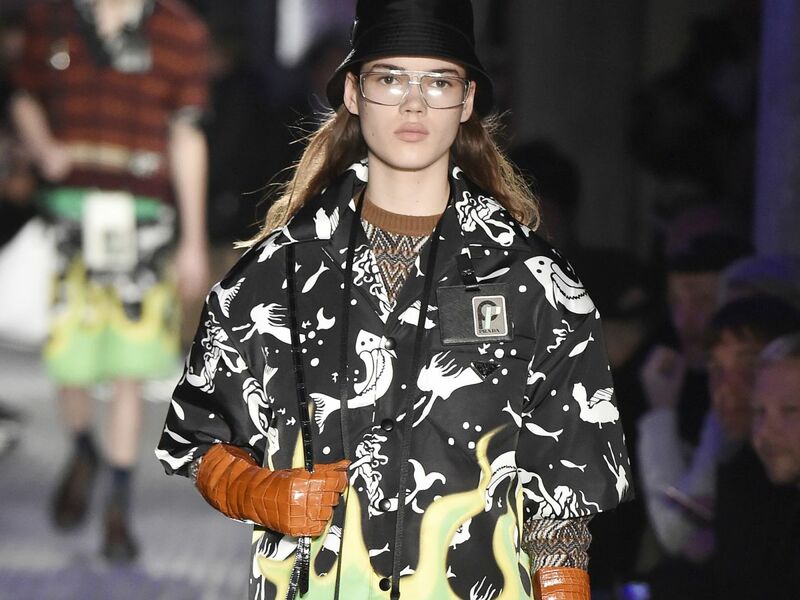 Of course scary, of course worrying, but also interesting because of the feeling that big changes are coming,” Prada said in an interview, hinting that maybe like so many of us around the world, she too, is looking to the past to help guide her into the future. 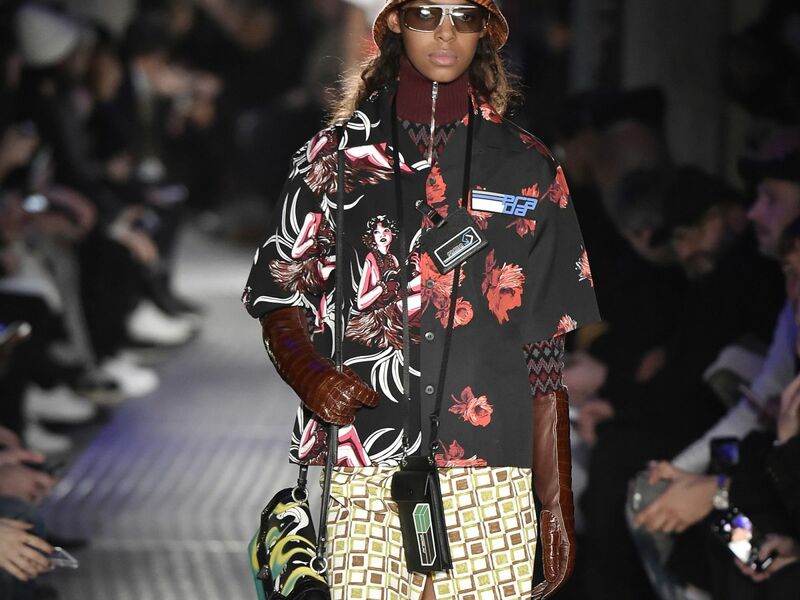 But even without getting all philosophical about it, Prada’s reexamination and mash-up of her greatest hits in recent years falls perfectly in gear with other designers who are instead examining — and pillaging — all the other reference images that have found themselves at the forefront of the culture. 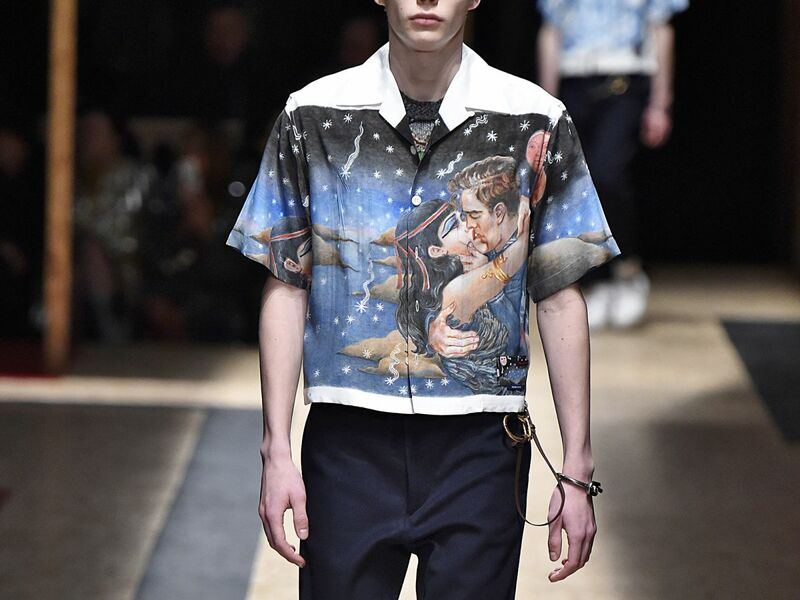 Whereas Demna Gvasalia at Vetements and Balenciaga and Alessandro Michele at Gucci are looking to memorable images and looks of their youth (acid washed jeans, scrunchies, the iconic Dapper Dan Vuitton bomber that had long been a staple of cool Instagram accounts and Tumblrs that ended up on the Gucci runway), Miuccia Prada can look back at herself; she can mine her own sense of nostalgia. Photo: Guy Marineau/Conde Nast/Getty Images. But beyond the sense of appealing to the millennials’ penchant for nostalgia — even for the things that came before then — there is something slightly subversive in her collaging. As themes of sustainability and being more eco conscious continue to slowly make their way to the forefront of the industry, these pieces are, in a way, a type of slow fashion. Sure, you can buy the geometric print skirt from Prada’s iconic spring 1996 collection (dubbed by the press as “geek chic”), or, if you’ve been around long enough and have a bit of a hoarder mentality, you can go ahead and fish out the original twenty-something-year-old version from the bottom of your closet. When so many designers are falling over their own feet trying to come up with the newest, wildest, most Instagram-friendly style they can think of, it is the ultimate power-move to say, everything I’ve done in the past 20 years is so great I can sell it to you again and it will still be exciting. Wait, So Who Made Meghan Markle’s Beloved Boat Neck Famous?